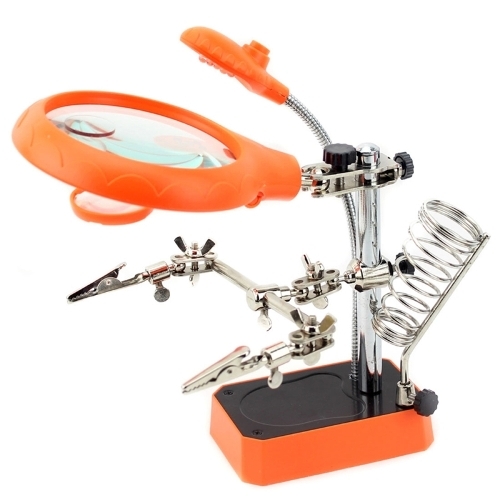 A useful Aid for soldering work or model makers. With interchangeable magnification, the two auxiliary lens are stretchable and angle-adjustable, making the operation more comfortable. 3 kinds of magnifying lens: 2.5X 90mm (diameter), 7.5X 34mm, 10X 34mm. An independent bright illuminating light with 5 LEDs is installed on flexible metal tube. Distance and angle of lights can be adjusted freely. It can be used as a desk lamp. Adjustable crocodile holding clamps and support clamps. Bottom battery compartment is furnished with steel plate which can enhance stability. The base surface is padded with steel sheet to increase base weight and reinforce stability. Powered by external power adapter of 3 x AA batteries (not included). Application range: Soldering Circuits, electronic welding, modelling, stamp collecting, embroidery, antiques, biological observation, reading, etc.